If this is your first time purchasing or using a cool mist humidifier in your house because the air has become too dry and uncomfortable for you and your family members, then it’s important you know the benefits of cool mist humidifiers and how your family will benefit from using a cool mist humidifier in your home. Below are 10 amazing benefits of cool mist humidifiers that we honestly think everybody should know. The biggest advantage of a cool-mist humidifier is that there is no heat or steam involved in its operation. 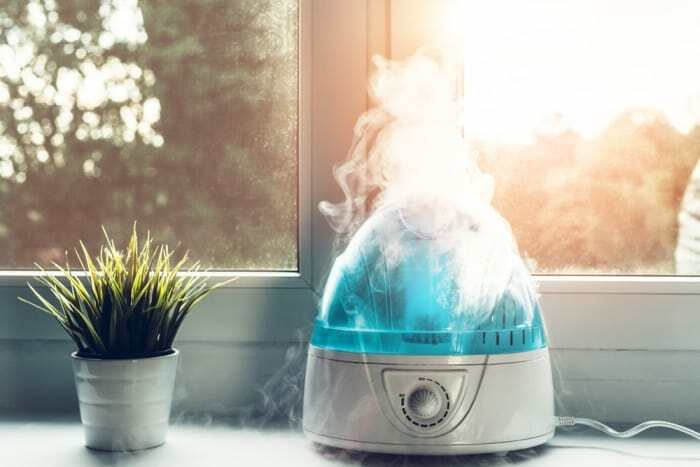 Regular humidifiers use some type of heating element to produce the steam they need, and if you have pets or children who get near that steam, they can get burned. Both types of humidifiers put moisture into the air so that people can breathe better, but a cool-mist humidifier uses a fan to blow cool mist into the air, which means you never have to worry about anyone in your household getting hurt. When you use a regular humidifier, the room can actually become warmer and uncomfortable, but a cool-mist humidifier doesn’t do the opposite; it doesn’t make the room too cool. In fact, you’ll only know that you have a humidifier going because you’ll be able to breathe better, will sneeze much less often, and you’ll be more comfortable all around. Your nasal passages will feel better lubricated, which means you can heal much quicker, and if you keep a cool-mist humidifier in your bedroom, you’ll sleep much better and will likely even snore less, which is beneficial to both you and your partner. While warm-mist humidifiers usually spread their mist in a concentrated area, cool-mist humidifiers cover a much wider area, usually the entire room. If your room is relatively small, you might consider getting a smaller humidifier, because they make them in all sizes. Because cool-mist humidifiers cover a wide area, you don’t have to worry about where you are sitting in the room because the cool mist is definitely going to cover you, and if you’re worried about too much cool mist getting into the room, which, for practical purposes, is never really a problem, all you have to do is switch to a smaller unit. More often than not, cool-mist humidifiers cost a lot less than the ones using warm mist to operate. This is because there is usually a special device inside of a regular humidifier that is designed to heat up the water being used for the mist, and that device can be costly. It is also more likely to break than a cool-mist humidifier because the latter merely uses a fan to produce the mist being put into the air. This means you may have to replace a regular humidifier much more often than you do a cool-mist humidifier, making the cool-mist units a lot more affordable. Heat humidifiers can actually damage your plants and your wooden furniture because the heat can be a detriment to the condition of those items. The coolness of the mist can help your plants grow bigger and faster, and since it doesn’t cause mold like many heat humidifiers do, you won’t have to worry about ruining your wooden furniture. Both furniture and plants are healthier and last much longer when you use a cool-mist humidifier, and this is very beneficial to a homeowner. Not only are cool-mist humidifiers less expensive when you purchase them, they also save you a lot of money on your utility bill. This is especially important if you want or need to run your humidifier for very long periods of time, which is why many people who use warm-mist humidifiers turn them at various times during the day. You can essentially keep a cool-mist humidifier running all day, every day, and still have a reasonable utility bill, but that cannot be said of a regular unit. Unlike warm-mist humidifiers, cool-mist units put just the right amount of moisture in the air, which of course reaches your skin and makes it both look and feel better. If you have dry or itchy skin, cool-mist humidifiers can add a little moisture, but not too much, like some warm-mist units do, which enables your skin to look great. If the city you live in gets too dry during certain times of the year, a cool-mist humidifier is much more beneficial than you might think. If the air in your home is too dry, certain conditions can result, such as sinus problems, congestion, and cold and flu symptoms. Adding just the right amount of moisture reduces the risks of these and many other conditions, which means that your entire family can be a lot healthier. Especially if you’re prone to nosebleeds, dry skin and nasal passages, or any type of allergy or asthma problem, you’re likely going to find these things happen a lot less often when you use a cool-mist humidifier on a regular basis. Warm-mist humidifiers have devices inside of them to create the steam, which get dirty and can even create build-ups of certain minerals that need to be cleaned out regularly. A cool-mist humidifier requires only an occasional rinsing of the device with plain water and no cleaning chemicals. In addition, some warm-mist humidifiers contain systems that are quite complex, so you have to take them apart and put them back together after you clean them. Overall, there is very little maintenance when it comes to cool-mist humidifiers, making them a great deal for many reasons. A cool-mist humidifier does a great job of preventing the static that can be inconvenient during the winter months, and again, it’s because these units put the right amount of moisture into the air without putting out too much of it. If you’re touching furniture and other items in your home and experiencing static, it is because your indoor air is much too dry, and, when you use a cool-mist humidifier, just the right amount of cool, comfortable mist will be placed in the air so that you can eliminate that problem quickly.